Sold "as-is", not eligible for manufacturer's warranty. Product information "HAIX Airpower R7"
HAIX® Airpower R7 boots are built to last and work with your body as you provide the vital services society needs. EMS, Firefighter, and other emergency and first response personnel take note - this lightweight boot is made of protective materials such as CROSSTECH® which are resistant to bloodborne pathogens, chemicals, and more. These NFPA certified emergency response boots are suited to life at the station and out in the field. EMS work is hard on the feet, with the HAIX® Airpower R7 footwear as part of your everyday gear, experience the breathable, waterproof comfort every time you go to work. Sturdy steel grommets keep your industrial strength laces firmly in place over rough terrain and flat, cement walks to offer maximum molding to your foot's natural contours. This enhances grip and prevents on the job injuries as well as repetitive use foot strain. For emergency response boots that really perform during the call of duty, you need the HAIX® Airpower R7. HAIX® Airpower R7 Field Boots are built tough and meant to be tender from the anatomically made steel toe to the European made black leather upper material. The leather/textile combination of these emergency response boots are also durable and protective under a variety of harsh conditions on the job. On the exterior of the steel protective toe cap is an exterior rubber toe cap that provides some additional protection from the abrasion you can get whether its working around the station or kneeling to treat a patient. The Airpower R7 is waterproof and breathable, assisting in the prevention of chemical and bloodborne pathogen exposure since you have the ultimate protection of a CROSSTECH inner liner. CROSSTECH® materials prevent the inside from becoming wet, especially when out in the rain or slogging through puddles. HAIX® emergency response boots use our Secura Liner® feature to ensure that your inner lining will not wrinkle, pull up from the inside of the boot, or pull out of the boot over time. HAIX® Sun Reflect leather lets your shoe stay looking good and feeling good by reflecting direct sunlight before it can sink into your boot and heat up your feet. Working together with the upper materials and the inner liner, the HAIX® Climate System helps to keep your feet dry and comfortable throughout a long day of wear. The HAIX® Arch Support System ensures that while you work and stand for long hours, your foot is able to receive the support it needs in the most natural position. The anatomically correct insole, is cushiony, moisture wicking, and machine washable. Regular washing of the insole will keep your boots fresher even in the heat of summer. You will be pleased by the slip resistant, heat resistant rubber sole. The HAIX Airpower R7 sole is non-marking rubber which is oil and fuel resistant. A steel puncture plate is embedded into the sole to keep your feet safe from puncture hazards on potentially treacherous surfaces. Antistatic properties dissipates static build up in your body through the sole and into the ground. National and international certifications add to the prestige of this highly functional, long lasting work shoe. By using an extended wear package, your HAIX® Airpower R7 Field Boots may last for a long time. The out of warranty work boots can be refurbished with original parts and materials, including any new stitching or replacement of profiled rubber toe caps, sole retreading, or insole repair. At the time this work is performed. Shoes will be cleaned and deodorized. You receive them looking and working as good as new! Treat yourself to the best working tool you can find, high quality, excellent fitting Airpower R7 boots. They come in sizes 4.5 to 15 and a variety of widths. Related links to "HAIX Airpower R7"
Our comment on "HAIX Airpower R7"
Customer reviews for "HAIX Airpower R7"
This is the 2nd pair of these boots that I've purchased. My last pair lasted 6 years and still look great! Souls are in great shape, despite nearly daily used on an ambulance. The only reason I've had to replace them is the soul started separating from the right boot near the toe box. The boots are comfortable and keep my feet protected all the time. By far, the best boot that I've worn. Thank you for your feedback on the Airpower R7. We are happy to hear that your first boots lasted you so long even with daily use that you decided to get another pair. We are glad that these boots are comfortable and offer your feet optimal protection. We hope they continue to serve you well and that you remain a loyal HAIX customer in the future. I recently purchased a pair of the R7 I work EMS in Florida and wanted a breathable boot that I could wear with uniform shorts as well as pants. The R7 has certainly fit the bill I am very glad I chatted with Hiax online about the sizing. I am a D to DD width and Hiax recommended I order a wide as the boots run a little narrow. Absolute right call I am very happy with my R7s great fit breath ability, and the Crosstech gives me added confidence that I am protected from blood born pathogens. The one thing I changed was the lace length to 36 inches. The speedlace eyelets make them a breeze to get on and off quickly no need for zippers. Over all I am thrilled with the boots and definitely recommend them. Thank you for taking the time to review the Airpower R7. We are happy to hear that you have found them to be breathable both in pants and in shorts and easy to get on and off. We are also glad we could assist you on the sizing and that you ended up with a great fitting boot that is keeping you protected while on the job. We appreciate your comments and hope these boots continue to serve you well in the future. They are not as comfortable as my Haix Protector Volt but very durable totally water proof top quality boots. I have been wearing them for about 5 months now and they show no signs of wear. My favorite duty boots yet! This is my second pair of Haix boots. Previously I wore a pair of Airpower 100's that I managed to wear into the ground over six years. I've never had a pair of boots last that long! I bought the R7's because getting them on and off quickly is no longer a priority for me (thus laces instead of zippers are fine) and I thought these would be more secure on my feet. I absolutely love them. They are true to size (I wear 10 Wide) and once broken in are some of the most comfortable things I've ever worn on my feet, second only to brand new running shoes. The only reason I did not give them a 10/10 rating is that they are not as breathable as I would have hoped. This still should not deter anyone from buying them though, as they truly are quality duty boots. I bought the Airpower R7's expecting the same quality and durability I received from the Airpower 100's, and so far, they did not disappoint! I have three pairs of HAIX boots - Fire Hunter AF's, Fire Hikers, and a pair of Airpower R7's. I have been extremely pleased with all three styles. I originally bought the Fire Hunters because I have a narrow foot and the regular rubber boots were killing me. Especially on auto accidents when you might be standing in one location for a couple of hours handling traffic. The Fire Hikers performed amazingly last winter when I spent six hours in the rain clearing roads and removing downed trees during a bad storm. I had just gotten the boots and really hadn't had a chance to break them in properly. They kept my feet perfectly dry, were extremely comfortable, and not one blister! I use the Airpowers to respond to medical calls. They too are very comfortable. 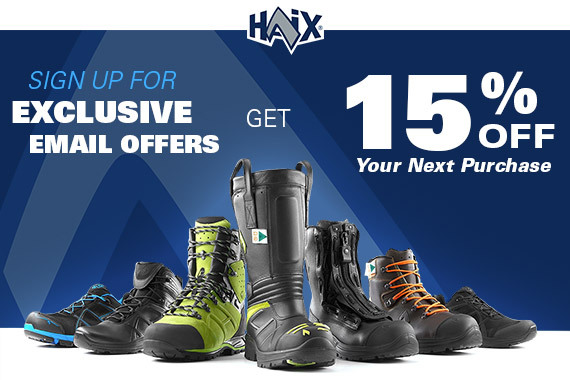 I highly recommend HAIX boots, especially if you have a narrow foot like I do.